Daniel Veerhusen, a former Madison Scouts member from 1973 to 1980 had the opportunity to suit up once again and perform with the Madison Scouts Alumni Reunion Project after Friday night's Division I Semifinals event. Recently in his life, Veerhusen was diagnosed with a type of West Nile virus brain infection that went undetected for several years. "Last year I was hospitalized and not expected to live longer than a week," he said. How Veerhusen has survived and how he has lived a dream with the Madison Scouts Alumni Reunion Project. 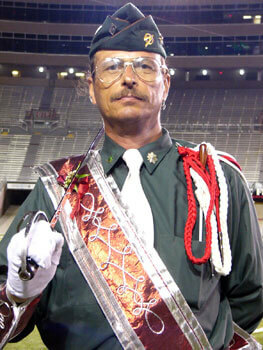 Daniel Veerhusen as a member of the Madison Scouts Alumni Reunion Project honor guard.